Cloned from Peghole by typerider. Info: Created on 5th September 2009 . Last edited on 6th September 2009. PS: Crackhouse was renamed 'kraakhaas'. Yes, minimal but very groovy stencil. Take my 10, of course. Both safehouse and crackhouse are very well designed. I have preference for crackhouse, which would be perfectly suitable for a brit pop gig poster or an underground party flyer. It's another 10.
huh, thanks all. very pleased with the messages! Congratulations! FontStruct Staff have deemed your FontStruction worthy of special mention. “safehouse” is now a Top Pick. I can see what you did here. Very simple. In fact, too simple. I can't see why this was made a Top Pick. I can barely tell the "v" from the "u". You need to do something about the "m" and "n", too. And I'm even gonna talk about the "7". Sorry to put this down, but I just don't see how so many people, especially Frodo7, could like this so much. Well Alex, sorry you can't see it. The thing is: if you limit the game to a very small grid it sets its own rules in which you can move. the inner logic of the first characters made takes over. And then it becomes very hard to keep it simple. I only play with fontstruct in this experimental way. Beyond that it doesn't really interest me. I get bored fast stacking bricks on bricks. I know it is not perfect, but it is never too simple. Look at all minimal modular fonts out there (bauhaus, krouwel, olyf…) and you will have the same problem. V's are too close to u's, m's are always too wide. But there is an achievement in finding a logical compromise and a kind of abstract beauty. That is how this kind of game is played. Anyway: your critique is welcome. I mean that. The early 10's were nice but a bit over the top. Greets, Peter. Oh, one other thing. Never judge a minimal (or maximal) font on it's character set. See it in text, at least in some words. Wordshape counts, and you would be surprised how many seemingly 'unlogical' decisions in some characters make them work well in words. P.
Typerider, you've very adequately answered aaaalllleeeexxxx 's reservations, but let me rush to your defence anyway!! Any fool can add doodads to make glyphs more legible (any number of intaglio's fonts!) but minimal+legible+elegant takes a special elan, and that's what the staff rewarded, I believe. Congratulations, a considerable achievement. much appreciated, especially from you, Intaglio! @ aaaalllleeeexxxx : the rating system has been discussed a lot in the topics concerning the next new features of FS, and I think a 10 rewards from now on as well a good design, which is worth being noticed, and a truly great fontstruction. The nuance is to be found in the comments. Differently speaking, you may understand a 10 as a "I like" flag. For my part, I merely don't rate a font I don't like or when I think it's not worth it, rather than giving it a low rate. Top Pick is well deserved. style and movement called minimalism (a.k.a minimal design) can be traced back to the 1920ies: in architecture, graphic design, and of course typeface design. We can see its lasting influence on contemporary web desing too. If you want to learn more about style and beauty in this field consider the following book: The Elements of Typographic Style by Robert Bringhurst. It's a typographic classic already and should be under the pillow of any prospective designer. Well Frodo, you are the man! refering to Bringhurst in the discussion about a modular stencil font. But thanks for that. Strolling around in this wonderful playground which Fontstruct is, doesn't mean we can't have the other end of the rainbow in mind: textface type design. 'The elements of typographic style' is indeed my number one tip to all my typography students from the first class on. A little bible I consider it. Your name is not really Frodo, is it? this is verry cool! good work! Congratulations! FontStruct Staff have deemed your FontStruction worthy of special mention. 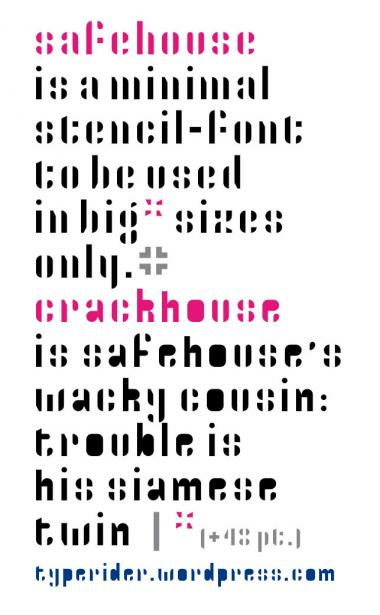 “safehouse” is now a current Featured FontStruction. Thank you very much Gustavo. This si much appreciated! excellent font ! I love stencil !